7 :: Gerrards Cross Golf Club is considered one of the most attractive courses in South Buckinghamshire. Kindly sponsored by 7r Group. 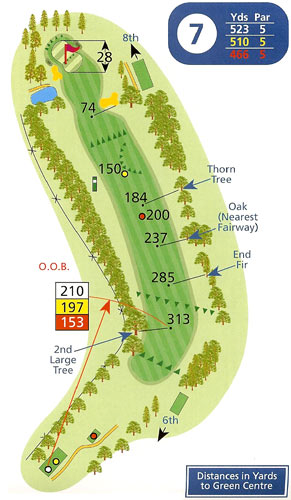 This is a dog-leg par 5 where the player's only realistic chance of reaching the green in two is to fly the tall trees at the corner, a carry of 260 yards. The fairway is generously wide but there is a water hazard on the left side about 30 yds from the green. Watch for walkers on the public footpath which runs across in front of the green.